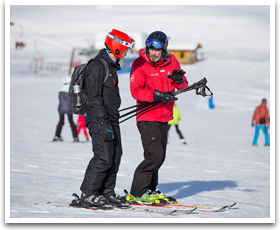 The biggest British-run snowsports school in the Alps - over 800 English-speaking instructors, all qualified to a minimum of BASI Level 2 or national equivalent. 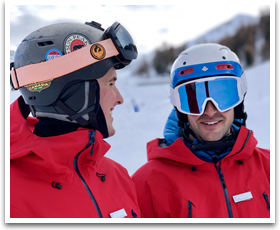 Catering exclusively for Interski clients, out team really know their stuff and, with safety and enjoyment a top priority, they will create the perfect enironment to develop your confidence and skill on the snow, no matter what your level of ability. Please read on for further details of the different tuition packages available. Unfortunately, we are only able to offer ski school to our own clients. 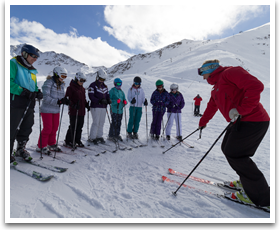 If you would like to take advantage of our ski school tuition packages, why not book your ski holiday with us? Simply visit our ski holiday search page to check prices and availability or give us a call on 01623 456333.